It all started as a Christmas gift. My Mom must have recognized a longing in me to tie and fish my own patterns. It was a beginner's fly tying kit. I still have the original box in the closet of my den. I often wonder if she knew how far I would go in this pursuit. I think she did. She had that kind of foresight on most matters! 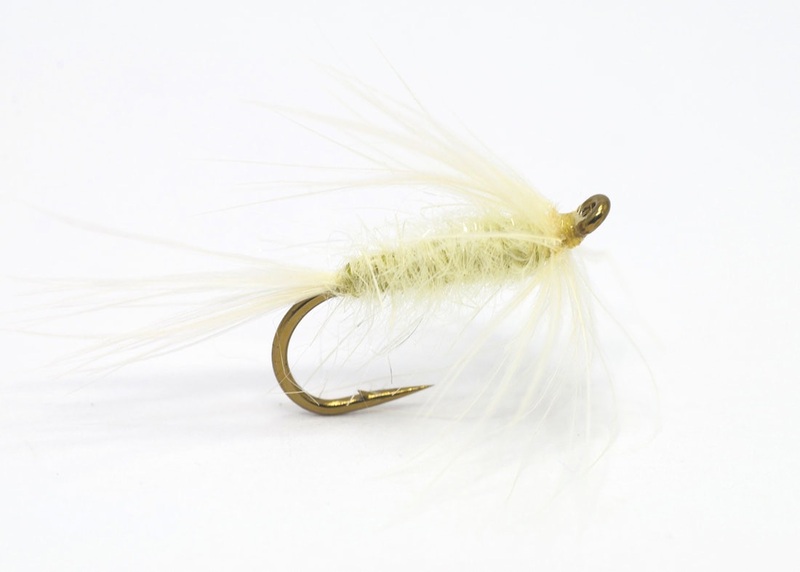 So continues this fly tying journey from its start thirty five years ago. I find myself squarely in the middle of tying and fishing flymphs. The influences along the way have been many, both in literature and in the quality individuals I have met who share this passion. LONG LIVE THE MIGHTY FLYMPH! Hook: Mustad 94842 (R50U) in sizes 10-12-14 or TMC 9300 or Cabela's Model 30. Thread: Uni brand 8/0 "Camel"
Body: A pre-spun fur body made with Hareline Dubbin brand "Krystal Dub" in tan color spun on Langley Brand fine silk # LT1257 "Gold" or similar. Well waxed. Hackle: Two turns of the softest, webbiest tan colored hen saddle feather to size - a bit long is preferred. Head: Very small. Minimalist turns. Hook: Gamakatsu R10-B Retainer Bend, Barbless in Size 12. Thread: Danville's 6/0 waxed in cream color. Tail: three wood wuck lemon flank fibers with the natural curve sloping upward. Well marked as possible. Dubbing: Dave Whitlocks Synthetic Living Fiber (SLF) in "Stonefly Gills". Hackle: wood duck upper covert wing feathers - 2-3 turns at most right at the head. Head: Danville's cream (above) very small, minimal wraps to finish. Hook: Mustad 94842 (R50U) up-eye dry fly hook in sizes 10-14. A really nice alternative is TMC's 9300 in the same sizes. Thread: Uni brand 6/0 "Light Cahill" color or Danville's 6/0 in Cream color. Tail: 4-8 long, very soft fibers from a cream colored domestic hen cape. Body: build up tying thread tapered on ends of the body. Cigar shaped. 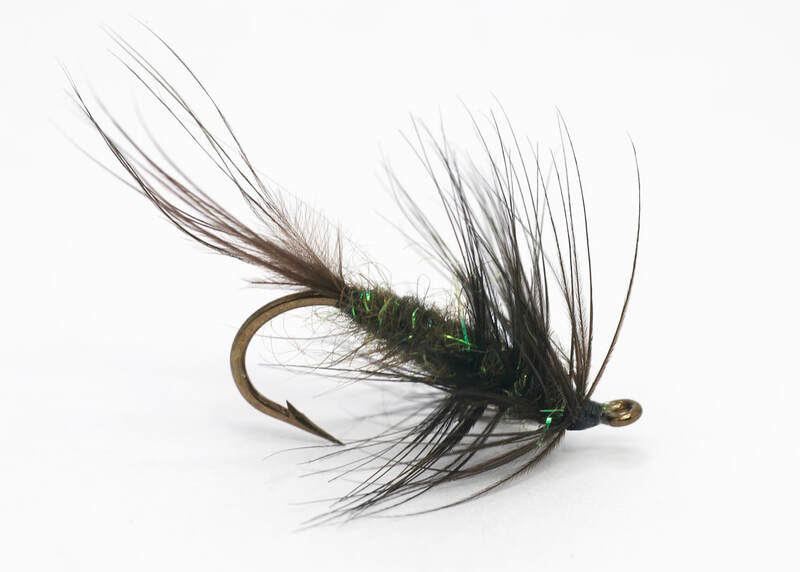 Dubbing: A lightly dubbed pre-spun flymph body made of Borden's Hare-tron #2 March Brown. Hackle: 2-3 turns of a slightly long fibered and well rounded cream colored feather from a domestic hen cape. Tied in by the stalk. Wax: Tying Wax - not dubbing wax. There is a difference. Use it liberally at various points in the tying process. Thread: Danville's 6/0 black waxed. Body: Krystal Dub in "Medium Brown" pre-spun into a flymph body. Not too full. Hackle: 1 black hen neck feather. Head: Smallest head of black thread. Body: 60/40 mix brown mohair and Hareline dubbing #23 (rust) spun on Pearsall's gossamer silk, claret. Note: Brown mohair dubbing from Pete Hidy's collection and graciously provided by Lance Hidy for this pattern.